It's easy to separate the well-known artists from the hidden talents of the world. All you really have to do is ask random people on the street. Britney Spears? "Yup, heard of her. She married that Federline thing, didn't she?" Check. Clay Aiken? "I remember that dude. His shirts were snappy." Check. Rihanna? "Yep, she can really croon! Her last album was awesome!" Check with a freakin' asterisk. Filo & Peri? "Ummmm... wasn't that a comedy duo in the 70s? Y'know, the dudes that were always smokin' it up like marijuana was their life support?" No, that was Cheech & Chong. "Well, I guess I don't know who Filo & Peri are." 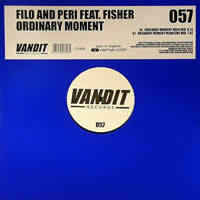 Filo & Peri (perhaps known to themselves as Domenick Filopei and Bo Pericic) are one of the finer trance duos of modern times, hailed by popular DJs across the globe. "Oh... TRANCE? No wonder I hadn't heard of them. They're probably from that country... what's it called... er... Europe, that's it." Interesting, my geographically-impaired automaton friend... except that Filo & Peri come from New York! Ha! Alright, enough gabbing about how nobody knows who Filo & Peri are; let's get down to business! One of their more recent releases is Ordinary Moment, which comes in two mixes on one vinyl. No outsider remixes need apply; they have all the power they need on this vinyl disc of mystery! The first (which is probably the preferred of the two, according to THIS reviewer) starts out with a standard beat, maybe even a little junglesque if you will. Eventually, the techy bass flows in like lava, followed by a more standard trance bassline. Soon, the esoteric vocals of Kathleen Fisher begin; her wispy voice sends us off on a euphoric journey as she sings about how she only wants an ordinary moment to occur between her and her love interest. (Don't we all?) These lyrics are repeated again as a spanish guitar plays its looped course. At about the 4:37 mark, the deep bass drops and we hear spatial sounds, followed by a subdued but emotional reverbed piano, and then Ms. Fisher returns with a few more words of wisdom. It is at this point when I came to realize that this song is more than just a trance powerhouse; this song also provides what I consider to be an essential philosophy to human existence in one particular lyric: "Did you know that it's a crime to never find the time to love?" Simple, yet breathtakingly sublime in its practical application! You don't hear the truth like this too often. Or maybe I'm just overanalyzing... Okay, it's time to wipe the tears away, for the reverbed guitar begins to be plucked again, and it soon joins the standard pumping bass from before. Some more vocals (including a repetition of the aforementioned colossal philosophy) round out the main portion of this track before it begins to wind down. This is truly the type of track that I could live off of, for it is very enticing to the ear, responsive to the mind, and even infectious to the feet! I give the Main Mix a solid recommendation. As for the Midnight Mix, it's certainly different...to a certain extent. Tom-style drums enter us into this new version, and the spacey pad hovers almost silently over the less-forward bassline. Kathleen Fisher's vocals return in full form again, although not quite as wispy as before (perhaps this is a different recording of her vocals). The looped guitar is quieter this time around as the vocals are given their encore just as in the Main Mix. Soon afterwards, that same space-pad / piano combination is used, although the piano is a little more raw this time around. The same guitar returns, which is soon covered with that tom-tom beat and more subtle bassline. Vocals follow, and then the winddown. As a whole, this is a much less exhilarating mix than the Main Mix, but it would adequately serve a crowd that's perhaps not down with the whole trance vibe at the moment. It might even be more suited for a set of house music, if the DJ dares to be daring.